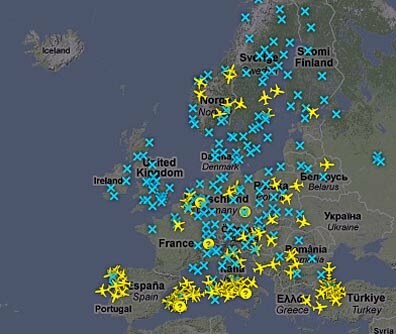 This image showing 128 aircraft in European airspace, would indicate that airlines are beginning to find ways of getting planes into the air. 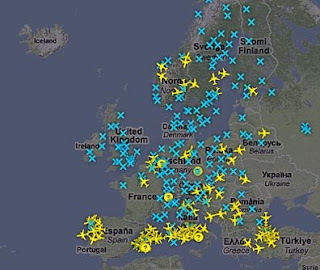 However the patterns show where the plume is still probably too dense to allow flights. Including the UK, where the Government is apparently going to send Navy ships to help. Hekla is the only one from Iceland that makes the list, which, given that Katla is likely to be perhaps ten times as large as the current eruption from Eyjafjallajokull, and may well go in the next 2 years perhaps underscores the occasional need to question expert opinion.